Take exit 16 and turn Left at the lights at the end of the off ramp. Follow Southampton St., which converges into Massachusetts Ave. At the intersection of Massachusetts Ave. and Melnea Cass Blvd., turn left through the lights onto Melnea Cass Blvd. You will see the Hampton Inn on your right. Follow Melnea Cass Blvd. until you reach Shawmut Ave, which is one street after Washington Street as you are traveling on Melnea Cass Blvd. Take a left onto Shawmut Ave and at your second traffic light, take a right onto Malcolm X Blvd. The RLTAC will be a ½ mile on your right (large brown building with green roof) at the intersection of Malcom X Blvd, Tremont St/Columbus Avenue. Take exit 18 and follow the directions to Massachusetts Ave. At the intersection of Massachusetts Ave, pass through the lights onto Melnea Cass Blvd. You will see the Hampton Inn on your right. Follow Melnea Cass Blvd. until you reach Shawmut Ave, which is one street after Washington Street as you are traveling on Melnea Cass Blvd. Take a left onto Shawmut Ave and at your second traffic light, take a right onto Malcolm X Blvd. The RLTAC will be a ½ mile on your right. Take the Orange Line to Roxbury Crossing. The Reggie Lewis Center is directly across the street from the station. PLEASE NOTE: Currently there is a major construction project directly behind the Reggie Lewis Center. Parking in unauthorized areas will result in your being ticketed by the Boston Police. 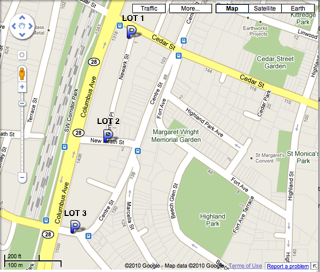 To get to Lot 2, take a right out of Lot 1 onto Cedar Street and take a left onto Columbus Avenue. Then, take the next left onto New Heath Street. Go 30 yards and take a right into Parking Lot 2. To get to Lot 3, take a right out of Lot 2 onto New Heath Street and take a left onto Columbus Ave. Proceed to the next set of traffic lights. At the set of lights take a left onto Centre Street. Go 30 yards and take a right into Parking Lot 3.